The PHH Corporation story is pretty well known at this point. Before two weeks ago, it operated in two unrelated businesses: mortgage origination/servicing and fleet management leasing. At the insistence of an activist campaign (which the activist curiously exited last week) the company sold off it's fleet management business to Element Financial Corporation for $821MM net of taxes ($1.4B pretax) to create a purer play on mortgage origination and mortgage servicing rights. The mortgage origination business is struggling in the current environment, refinances have mostly dried up as those who could refinance already have and the home purchase market has yet to really show signs of strength as consumers are struggling with debt and stagnant wage growth. The servicing side of the business however should become more valuable as interest rates rise and fewer mortgages are refinanced stretching out the length of time borrowers maintain their mortgage and increasing the servicing fees collected by PHH. The business is at a cyclical low, layoffs are in the thousands across the industry, sentiment is low, and that creates a potential opportunity when teamed with the sale of the fleet management business. PHH is planning on repurchasing up to $450 million in stock over the next 4-5 quarters, including $200 million shortly after the 2nd quarter earnings release, or a total of ~32% of the market cap. 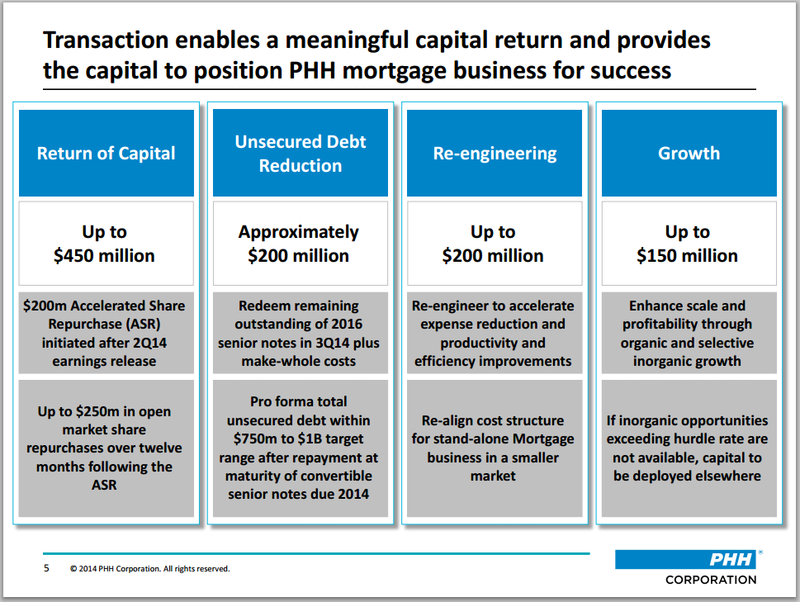 PHH's shares trade at 0.75x proforma tangible book value (with the optionality of the mortgage servicing rights value increasing in a rising rate environment) and within a few weeks there will be a large indiscriminate buyer in the market scooping up shares. Approximately 30% of the shares are short, and 40% of the shares are in the hands of Hotchkis & Wiley, PIMCO, Citadel, and DFA, plus another 10% in index funds, sets itself up for a potential small short squeeze rally. So in the end, you get a business that's retooling itself for the next stage of its business cycle at a cheap price with a near term catalyst. Following up on the REIT conversion theme that is ever so popular this year, there's an interesting exchange offer giving CBS shareholders the opportunity to swap CBS shares for CBSO at a 7% discount. CBS Outdoors Americas (CBSO) is another REIT conversion that split-off of CBS Corporation (CBS.A/CBS) earlier this spring via an IPO of 19% of the company on 3/27/14 (CBS retained the remaining 81% stake). CBS Outdoors is a billboard and out of home display advertising company that operates over 350,000 billboards throughout the United States, Canada, and Latin American. The company generally owns the physical billboard assets but leases the underlying sites from property owners. Their advertising revenue contracts are usually short term in nature, however billboard advertisements are seen as DVR proof (or as the company puts it "always on") and their popularity has increased in recent with advertisers as print and other forms of advertising have suffered. The company is focusing its capex efforts on converting select billboards to a digital format which brings in 3-4x the revenue as engagement improves and advertisers can be more targeted (night versus daytime, etc). It's an established business that's relatively stable, although is subject to the cyclical nature of the economy as advertising dollars ebb and flow. The main reason for the split-off is so CBS Outdoors can convert their corporate structure to a REIT and eliminate most corporate level taxes. Unlike some of the other conversions I've been highlighting, CBS Outdoors has already secured the private letter ruling (PLR) from the IRS back in April which is why the pre-REIT discount isn't as significant here. But because CBS still owns 81% of CBSO, it cannot formally convert to a REIT until after the exchange offer is complete, which it plans to do immediately. The conversion purging dividend isn't a big issue here, estimated at $500 million, $100 million of that will be in cash (or ~$0.83 per share) and the other $400 million will be in shares, or roughly 12.4 million (+10% to the outstanding) in additional shares. CBS Outdoors has two pure play display advertising rivals in the US: Lamar Advertising (LAMR) and Clear Channel Outdoor Holdings (CCO). Lamar is also pursuing a REIT conversion, Clear Channel is a little murkier as it has a complicated private equity structure that makes comparasions more difficult. They're all valued roughly the same at 11-12.5x forward EBITDA, but that's still a moderate discount to the REIT universe that trades for 15-20x EBITDA. From an AFFO prespective, CBSO earned approximately $2.00 last year, so proforma for the purging dividend its trading at 15x trailing AFFO. Not screaming cheap, but still a slight discount to traditional REITs. I tend to look for opportunities that don't screen well, CBSO doesn't look attractive on a traditional P/E basis (~22x), even though the REIT conversion is well known, it will take some time for REIT investors to become familiar and comfortable with the outdoor sector. One risk to note is CBSO will not be included in any well followed indexes after the exchange offer is completed which may increase the time it takes to gain acceptance in the REIT sector. As a way to get an even better valuation, CBS shareholders can exchange their shares for CBSO shares at a 7% discount. The exchange essentially works as a buyback for the parent CBS as it will retire the shares that are offered in the exchange. There is an odd lot provision where holders of fewer than 100 shares of CBS will not be subject to proration provided they tender all their shares. No fractional shares will be issued, and there is an upper exchange limit of 2.1917 CBSO shares for each CBS share. The offer expires on July 9th, so if you want to participate you need to act quickly. After the exchange is completed, CBS Outdoors will have the right to keep the CBS name for 90 days before rebranding, and they'll have up to 18 months to rebrand the 350,000 billboards which sounds like quite the endeavor as well. Overall, CBS Outdoors Americas is a moderately undervalued security that is made more attractive via the exchange offer. I purchased 99 shares of CBS, to avoid the proration, and have submitted my shares for exchange effective next week. I don't anticipate making it a long term holding (few weeks to a few months), but I'm comfortable participating in the exchange offer and accepting the market risk given CBSO's relative undervaluation compared to REIT peers.